April 22, 2017, all locations – American Institute students and staff joined people in 192 countries to promote awareness of environmentalism and take action to preserve natural resources as they marked the 47th annual Earth Day. 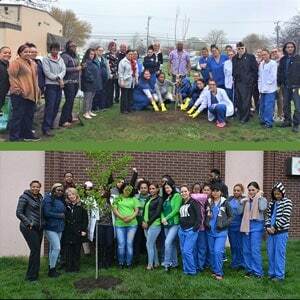 In honor of Earth Day, the Clifton, Toms River, & West Hartford campuses all planted trees. At Clifton, about 50 students wearing Earth-day green planted a white cherry blossom tree alongside the pink cherry blossom they planted last year. Toms River students also planted a cherry tree. Taking part in Earth Day is one of many ways American Institute encourages students to get involved in their communities. Service to others is a core value at American Institute, and events like this provide students with an opportunity to contribute positively to their campus and the community.